Yesterday I found myself in Southsea with a morning to kill and two small children to do it with. I make it sound like I opened my eyes, stretched, rolled over in bed and came face to face with the seaside. My life is not that mystical, I did know we were on the way to Southsea, not least because I was forced to deal with some spectacular car sickness from the boy and that doesn’t generally feature in my dreamscape. So, after a detour for Breakfast II and also some new clothes, we mooched down the sea front, and found A REAL LIFE CASTLE! Not just that, it was free and just big enough to keep Alfie interested/ running non-stop while I trailed in his wake. We walked over the drawbridge and I explained to Alfie that the moat used to be filled with water. Alfie may not be saying the word yet, but he knows how to throw me a “Why?” look at the first sign of new information so that one throwaway comment led to a five minute explanation. And also to me realising my error. How do you explain castles, Henry VIII, and cannons to a two year old boy without tapping into his barely contained bloodlust? So we did some talking about how there used to be people who lived in the castle called soldiers and who sometimes had to stop people from taking over the country. Not sure my comparison with his little sister taking over his favourite toy was the best analogy but I was really struggling with this one. Then we went inside and discovered cannons. And more excitingly for my son, piles and piles of cannon balls for him to climb over. So then we talked about the fact that the balls went inside the cannons and were like his football, but very heavy and that the cannon was what people used to throw them very far. A little selective, but he’s two, and he will learn why people throw weapons at each other soon enough. The we went round the castle and he was desperate to look out of the windows. That meant I had to become “that parent” and allow him to climb onto the windowsill which at least gave me a forum to talk to him about why his windowsill was a few inches, and this one was a few feet. I thought it was appropriate to help him understand that cannon balls would make a helluva mess if they hit the castle wall, but yes, I am a chicken, so we skirted round the edges of why there would be cannon balls hitting the castle wall in the first place. 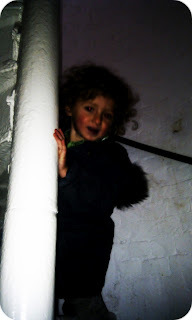 The most exciting point of Alfie’s visit was the chance to walk up a very long, and very steep spiral staircase to the roof. Is that what you call the top of a castle? I’m not entirely up on my castle parlance. Clearly I pondered this for too long because next thing I heard was “C’on mama! !” as he scampered away from me like a mountain goat. Have you ever tried to walk up and down a steep spiral staircase with a chubby teething baby strapped to your chest? No, because it’s a stupid idea. Once we had romped over every last inch of the castle, we ducked into the café for lunch. Alfie ordered cheese on toast, I ordered courgette soup. Lunch arrived. Alfie ate courgette soup, I ate cheese on toast. Such are the rules of the toddler. What interested me most though was our trip back to the car. On the way out of the castle we walked back over the drawbridge and the moat of glossy green grass. “Waaah mama” said Alfie, pointing enthusiastically. “Dere baw BANG! BANG!” said Alfie pointing back at the walls of the castle. So why is it, my darling son, that with all these smarts you still can’t get your head round the fact that BOYS DON’T EAT CHICKEN FOOD!! ?